First off, it’s expected – 74.4% of your subscribers expect to receive a welcome email. Also, a welcome email enjoys around a 58% open rate, making it the most opened email you will ever send. Secondly, in a study by Return Path, subscribers who read a welcome message also opened at least 40% of their emails from a brand in the next 180 days. Your time is limited, so why wouldn’t you just write a single welcome email and call it done? In the Return Path study, it was found that subscribers who read three messages in a welcome series tended to become strong fans and go on to read up to 69% of a brand’s emails. Since email marketing has a huge return on investment (ROI), a 3800% ROI and $38 for every $1 spent, it is worth the time it takes to build a strong welcome series. Nurturing your email subscribers from the beginning maximizes the value of email marketing. Your newest subscribers are often very engaged. They’ve just discovered your brand and they’re interested enough to sign up to hear from you. But, they’re still learning about you. It’s like meeting someone for the first time. You don’t want to throw them into your usual weekly emails before giving them a chance to build a relationship with you. Your email broadcasts may not make sense to these new subscribers, particularly if you’re in the middle of a launch. You don’t want your new subscribers arriving halfway through a launch sequence. What’s a good number of emails to add to your welcome email series? Some experts recommend sending up to 7 or even more emails in your welcome series. If 58% of people open your welcome emails, and you need them to open at least 3 emails to become loyal fans, seven emails are a good number to send in your welcome series. How Frequently Should You Send Your Welcome Series Emails? How often you send your emails will depend on your business and your goals for your welcome series. If you’re a blogger and your goal is to impress your new subscribers with a ton of value up front, you might send out your welcome emails over the course of two-three weeks. If you own an e-commerce business and your goal is to convert your subscriber into a customer, HubSpot has a rough timeline of seven emails over 60 days. So, you’re ready to start writing your welcome email series. What should you include in your emails? Your welcome series should follow an arc and have several different types of emails in the series. You don’t want to bore your subscriber by repeating the same type of email. The very first email in your series is the welcome. This email is sent immediately after your subscriber joins up or opts in to receive emails from you. To get them to respond to you. This might be a small survey or just for them to email you back to get them to make that first step in engaging with you. Finally, open a curiosity gap by making a postscript statement hinting at what’s to come in your next email. For example, you may drop a hint about your best traffic generating tips that you’re about to share in your email tomorrow. This helps get your subscriber into the habit of looking forward to and opening your emails. In the second email, you want to make good on your promise from the last email and close the curiosity loop you opened. This email should be sent within two days of your previous email, but you should let them know exactly when you’ll send it to them in the post script. At the end of this email, you might choose to use another post script to foreshadow your next email. You’ve started out your series with a warm welcome, delivered more value, now it’s time to share your personal side. In the third email, your goal is to connect with your audience by sharing a personal story that will resonate with your ideal client. What kind of personal story should you use? That’s a tricky question – we all have so many stories that we could share with our tribe. The best kind of stories to share here are those that are related to your business or your transformation. A good story is one that provides a teaching moment that your audience can learn from. Close this email asking your fans a question. If your story resonates with your subscribers, you’ll get responses. If you don’t get responses, you might need to tweak your story or check that you’re attracting your ideal audience. You can use a postscript at the end of this email if you’d like to foreshadow the next email in the series. Line in the sand – this is a deliberately polarizing email where you let your subscribers know exactly where you stand on a hot topic issue in your niche. For example, if you use Pinterest for your blog, you might talk about your stance on affiliate links on Pinterest. If you dislike affiliate links on Pinterest, you can let your subscribers know and tell them what they should do instead. Taking a stand like this means that anyone who is passionate about this issue and believes differently will unsubscribe. This is a good thing. You want to strengthen your connection with your fans who believe in the same things you do. Unexpected value – more value is always a good thing. Throw in an unexpected and exclusive freebie for your subscribers, a tutorial, case studies, or even a free video lesson. Pitch an affiliate product – you might like to soft pitch an affiliate product that you use in your business. Ask your readers about themselves – use the power of your email service provider to segment your email list by demographics and interests. Research has show that segmented, personalized email campaigns produce up to 760% more revenue. It’s never too early to start segmenting your audience. If collecting subscribers without ever emailing them is a waste of time, emailing your subscribers without ever making an ask of them is equally so. It costs both time and money to collect and email your subscribers so get into the habit of making asks in your welcome email series. What Comes After the Welcome Email Series? You’ve crafted a welcome email series you can be proud of, now what? It’s time to load your sequence into your email service provider and add tags so you can prevent your new subscribers from receiving your broadcast emails until they’ve completed the welcome series. Once your subscriber has received your welcome emails, they can go into your nurturing pool to receive your weekly broadcast emails. A welcome email is one of the most opened emails you’ll send and helps you create loyal fans. 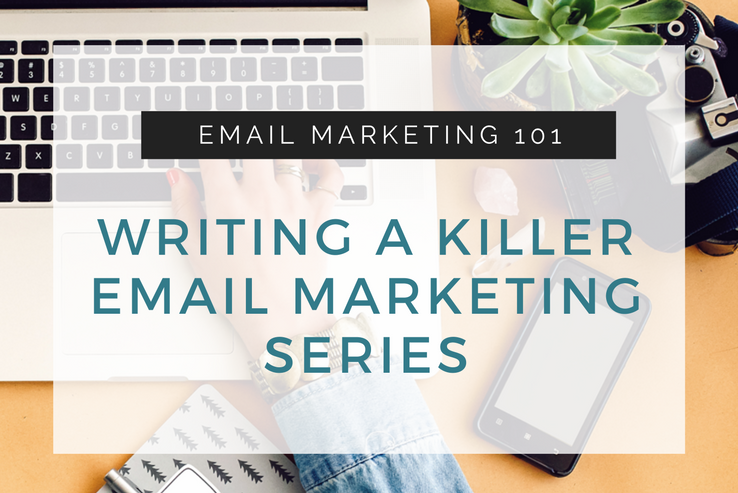 Throughout your welcome email series, you’ll provide your subscriber with valuable insights, personal stories, and your take on the important topics of your niche. Do you have a welcome email series for your blog? Or, have you received any great welcome emails recently? Let us know in the comments!